Land Pride’s new Bale Spears – the BS(E)30, BS(E)40, and BS(E)50 – will expand our popular line of hay-moving attachments. Like the 10 and 20 Series, each of these models is available in two mounts, Universal Skid Plate and Euro, with “E” in the model name to denote the latter. These three spear models are available with an assortment of spear options and combinations in lengths of 32", 39", and 49". Usable spear length is 4" shorter. Smaller stabilizer spikes are available on the BS(E)40 and stabilizer extensions with spikes are available on all three models. Frames are constructed from 3" x 3" square tubes with a lifting capacity rated at up to 3,000 lbs. 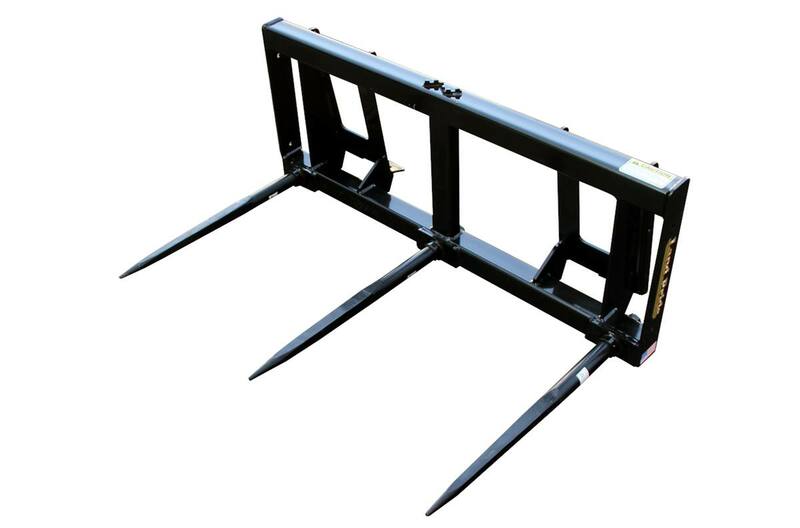 Designed to fit tractor/skid steer loader hitch or Euro hitch: The BS Series can be attached to machines fitted with a tractor/skid steer mounting plate and the BSE Series can be attached to machines fitted with a Euro style mounting plate. Spear units punch holes in end of round bales not in the circumference: Very little moisture can enter the bale where spears penetrate. Grappling type bale lifts perforate the circumference allowing moisture to penetrate the bale and accelerate bale deterioration. Weight of base unit without options & accessories: 165 lb. Frame lift capacity at 24" from face of frame: 3,000 lb. Spear length (three options): Overall length: 32 in., 39 in. & 49 in. ; Usable spear length: 28 in., 35 in., & 45 in. Spear diameter: 1 3/4 in. Extensions with 19" spikes: 70 lb. Three 32" spears: 44 lb. Three 39" spears: 50 lb. Three 49" spears: 63 lb.